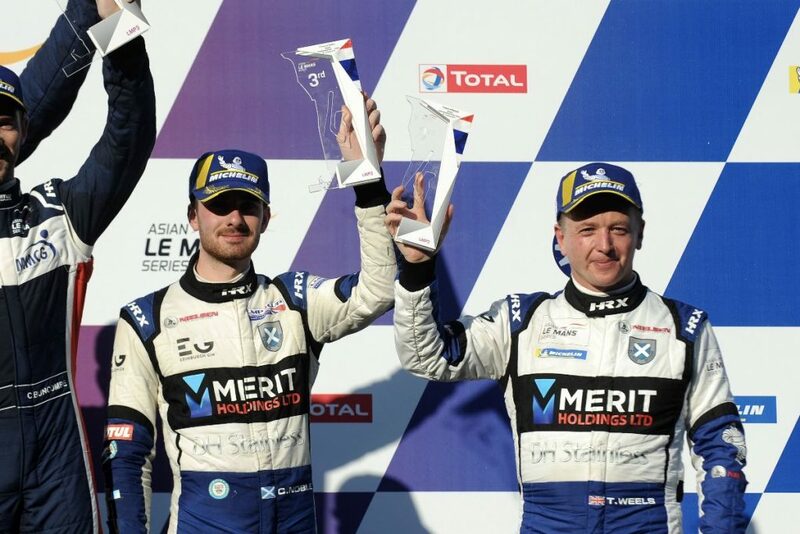 Ecurie Ecosse / Nielsen Racing enjoyed a second Asian Le Mans Series podium finish in a row today at the Chang International Circuit in Thailand. When Noble climbed in, the car was down to sixth, in what was a tight-race for LMP3 class honours throughout. The young Scot fought hard though and clawed his way up to third spot during his stint, before a fuel pick-up issue blunted his pace towards the end. Rather than gun for second, he was therefore forced to consolidate and secure the #79 crew third. In the end, he finished just two seconds ahead of Ecurie Ecosse / Nielsen Racing’s sister car, the #7 of Christian Olsen and Nick Adcock. Fourth place was a well-deserved outcome after a tough weekend for the duo, in which they lost a lot of track time after an incident early in Free Practice 2 forced them to sit out Qualifying and start from the back. During his stint, Olsen managed to drive from seventh to fourth, and was reeling in Noble in the #79 right the way to the flag. The result for the #79 puts Noble and Wells fourth in the championship, a point off third and 20 off the championship leaders with one race to go. The #7 meanwhile, is now fifth in the standings.